John Wall flirted with a triple-double as he logged 41 points, eight assists, and seven rebounds but it was all for naught as the Wizards can’t overcome their poor defensive effort and lose to the Clippers, 133-124. Four Clippers players scored at least 20 points tonight led by J.J. Redick with 31 and Chris Paul with 27 as Los Angeles halts the Wizards’ four-game winning streak. Scoring has not been an issue for Washington over the past month. It’s been the defense, or lack thereof. After getting out to an early lead against Los Angeles, Washington watched it evaporate at the blink of an eye. The Wizards were horrific in the first quarter as they gave up 39 points on 67 percent shooting. The highlight of the first quarter came when Jason Smith found the fountain of youth, took off and adjusted mid-air for this dunk. But even with the throwdown from everyone’s favorite uncle, the Wizards trailed 39-31 after one. The bench blew the lead in the first half last night but played much better tonight. The Wizards went on a quick 5-0 run to start the second quarter and got as close as two, 42-40 midway through the period. Once the starters came back in, the lackadaisical defense continued as the Clippers stretched the lead out to 14, 70-56. Bradley Beal passed Gilbert Arenas for most three-pointers made in a season with 206 on this shot right here. But there wasn’t a whole lot else to cheer for as the Clippers led, 74-63 at halftime. The terrible defense poured over to the third quarter as the Clippers connected on 10 of their first 11 field goals to start the second half and cracked 100 points at the 5:41 mark. But just like last night, the Wizards wouldn’t go away easily. Washington, who was down by as many as 19, used an 11-2 run to trim the lead to 12 at the end of the third quarter. 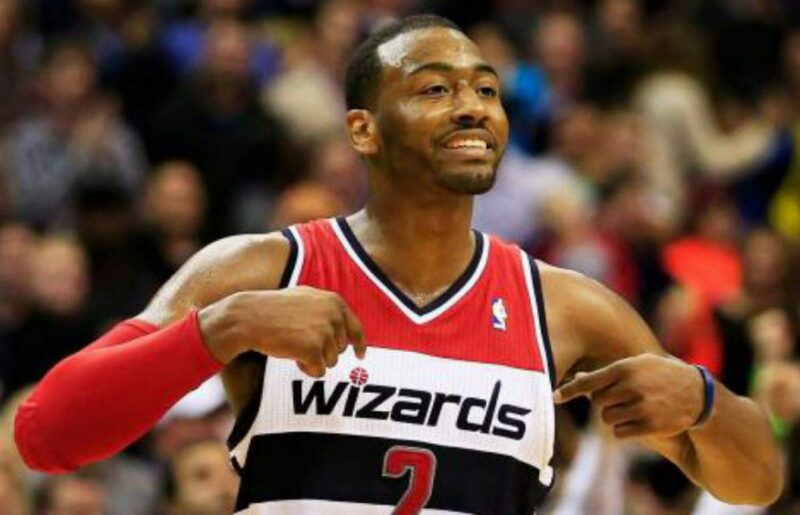 It was déjà vu as Wall took a loose ball from end to end for an easy layup only to get a steal and a dunk on the next defensive possession as Washington was able to cut the lead to six, 114-108 early in the fourth quarter as it looked like Washington had a fighting chance. But there would be no fourth-quarter collapse from the Clippers this time as they hang on to win this one, 133-124. Wall has elevated his game to another level since this road trip began and he added to those impressive numbers tonight. Wall scored 41 points tonight on 16-23 shooting (70 percent) to go along with eight assists as the Wallstar was in attack mode all night. John Wall did most of his damage in the at the rim and in the midrange tonight. We’ve become accustomed to poor defense from Washington and that was on display from the opening tip. Washington allowed a season-high 74 points to the Clippers in the first half on 59 percent shooting. The big men were a step slow all night as Morris and Mahinmi were both in foul trouble all night and the Clippers took advantage with 48 points in the paint. The poor defense in the first half set the stage for the defensive effort the rest of the night as the Clippers would hit the century mark at the 5:41 mark of the third quarter. Jason Smith attempted a career-high 10 three-pointers, with seven coming in the first half.